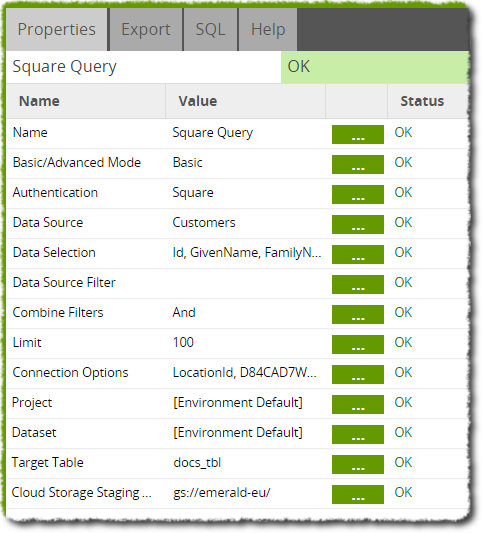 This component uses the Square API to retrieve data and load it into a table. This stages the data, so the table is reloaded each time. You may then use transformations to enrich and manage the data in permanent tables. The component offers both a Basic and Advanced mode (see below) for generating the Square API query. Note however that although this is exposed in an SQL-like language, the exact semantics can be surprising - for example filtering on a column can return more data than not filtering on it, an impossible scenario with regular SQL. 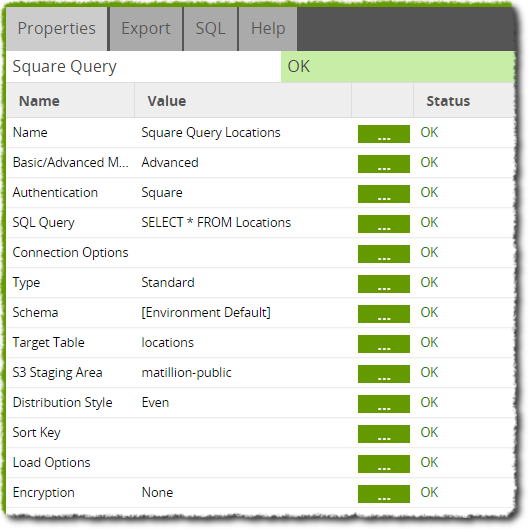 It is vital that the Square Query component is configured such that a default LocationId is defined. This can be done either through SQL, Data Source Filter or through the Connection Options property. SQL: In 'Advanced' mode, custom SQL Queries can be written and may include a clause such as 'where locationid = 'D84SJKFUI39E' where the LocationId is defined. Connection Options:A connection string 'LocationId' also exists that allows the default LocationId to be set through the Connection Options Property. The 'locations' table can be queried to find valid values of LocationId for the above purposes. Such queries can be done through the 'Basic' component setup by selecting the 'Locations' Data Source. Failure to provide a default LocationId for the component will result in the error 'Provide a LocationId in the query or connection string' when the component is run. 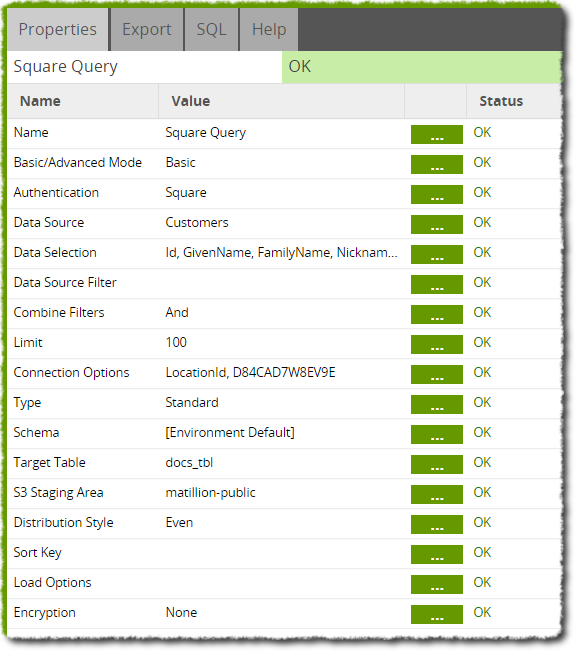 Basic/Advanced Mode Choice Basic - This mode will build a Square Query for you using settings from Data Source, Data Selection and Data Source Filter parameters. In most cases, this will be sufficient. 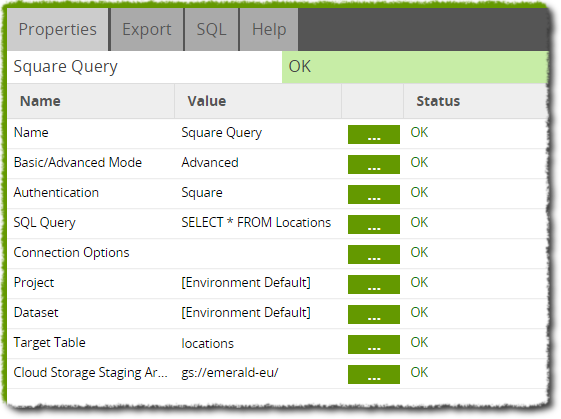 Advanced - This mode will require you to write an SQL-like query which is translated into one or more Square queries. Authentication Choice Select an authentication method, which must be setup in advance. Square uses the OAuth standard for authenticating 3rd party applications. More help is provided in the setup screens for OAuth authentication. SQL Query Text This is an SQL-like query, written according to the Square data model. Limit Number Fetching a large number of results from Square will use multiple API calls. These calls are rate-limited by the provider, so fetching a very large number may result in errors. Value A value for the given Parameter. 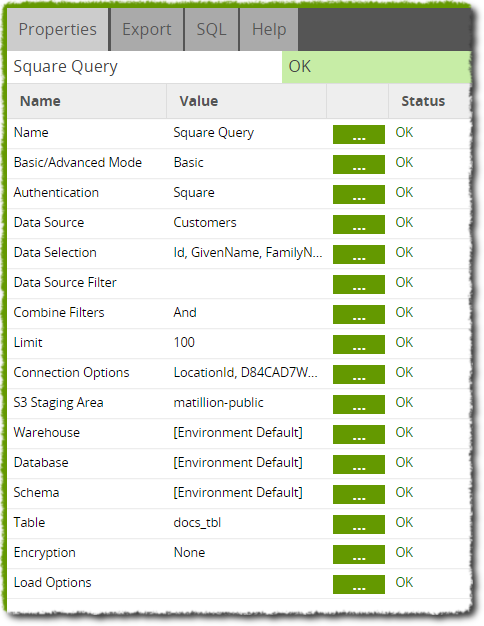 The parameters and allowed values for the Square data model are Connection String Options as listed here. 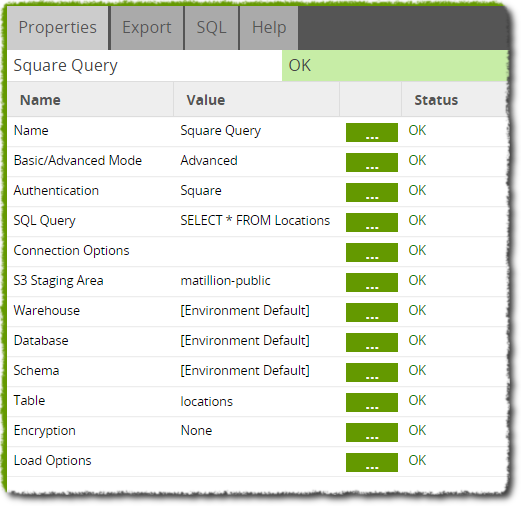 Connect to the Square Server and issue the one or more queries. Stream the results into objects into a storage area, recreate or truncate the target table as necessary and then use a COPY command to load the stored objects into the table. Finally, clean up the temporary stored objects. These are then stored in the table 'locations'. Right-clicking on the component and selecting 'Run Component' allows us to quickly run this query. In this example, we have only a single location that we can easily retrieve by sampling the table in a Table Input component. Using this LocationID, we can now load the location data using a job such as below. The Square Query component in this job is set up as follows. Note that the LocationID is now set in the 'Connection Options' property. Using a Table Input component inside a Transformation job allows us to sample the table and ensure the load has run correctly.